A 70-year-old woman had four pounds of cocaine stashed in her girdles and underwear, according to federal agents who found the stash during a pat down at John F. Kennedy International Airport in New York. Olive Fowler, a Guyana resident, arrived at JFK last Sunday on a Caribbean Airlines flight from Georgetown, Guyana. Traveling on a non-immigrant visitor’s visa, Fowler was selected for an examination by U.S. Customs and Border Protection officers, according to a criminal complaint. While agents examined her baggage, Fowler “was sweating profusely and avoiding eye contact with the officers,” an investigator reported. Suspicious agents then opted to peform a pat down search of Fowler. “CBP officers...felt a dense, hard material under the defendant’s clothes in the area of the defendant’s groin and buttocks,” the complaint notes. As it turned out, Fowler was wearing two pairs of compression shorts over her underwear, garments that held nearly two kilos of cocaine (which has a street value in excess of $73,000). The accused septuagenarian smuggler was then arrested on a felony narcotics charge. Locked up in Brooklyn’s Metropolitan Detention Center, Fowler is scheduled for an April 27 preliminary hearing in U.S. District Court. 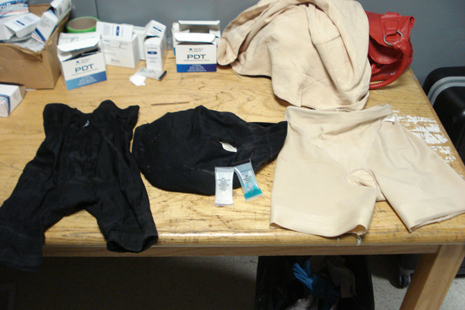 As seen above, CBP officials released evidence photos showing Fowler’s assorted undergarments, including a shot of one girdle that was cut open to reveal the cocaine hidden inside.